Imagine You Here! Recharge your strength, flexibility and life with 3 yogi masters who are joined together in their love for sharing all that is yoga. Are you ready to take a break, get back to nature, reawaken your appetite for adventure and find YOU again? Join Greg &amp; Susan Holmes and Zeek Vincent and recover and uncover the best of you with twice daily practices including: vinyasa, hatha and yin yoga, meditation and yoga nidra. Also included are workshops to focus and deepen your practice. Get pampered and nurtured with delicious food, jungle, and ocean. Recharge and live the enchantment of pura vida! E-RYT Certified Baptiste Power Yoga Instructors Susan and Greg Holmes’ enthusiasm and presence encourage the continuous discovery of the limitlessness in each of us. 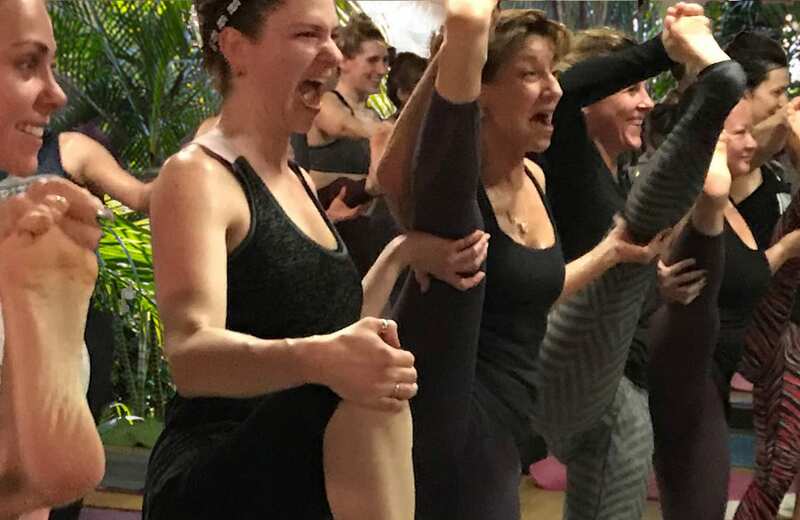 Their 20-year career in dance on cruise ships, stage shows, television, and on the Las Vegas Strip ultimately introduced them to the long- lasting benefits of an asana practice. Once retired from dance, Greg began body building again (he originally began at age 17), winning several trophies including the Vegas Classic Masters Championship. After rupturing his bicep, this body builder was ready to trade muscle size for a more healthful, flexible, and spiritual practice. Susan’s first yoga teaching experience was backstage at the MGM hotel in Las Vegas as a warm-up for Tommy Tune and the cast of EFX in 1998. In 2001, she graduated Summa Cumme Laude in Information Systems and left the stage and the yoga studio for an office. Weathering the effects of long hours behind a desk, she jumped deep into yoga and brought Greg along with her. They crossed paths with Zeek Vincent and his Baptiste Power Vinyasa classes. For both life was never the same! The strong vinyasa practice with Zeek’s inspiration encouraged a new vitality for both. They attended Baron Baptiste’s Teacher Training and received certification including the Art of Assisting. They have continued their growth with a 300-hour teacher training for hatha, pranayama, meditation and yoga nidra with Zuna Yoga in Indonesia. Both are also certified in Yin. Susan and Greg are Senior Master Instructors for TruFusions LLC and on the teaching training staff for ZFLOW Power Yoga. They present Hands-On Assists trainings, yoga workshops and life-opening yoga retreats. Zeek Vincent is a Registered Yoga Teacher (E-RYT 500) with Yoga Alliance, which acknowledges the completion of a yoga teacher trainings with an approved and active Registered Yoga School (RYS). He now conducts Teacher Trainings, as an approved RYS, as well as conducting Workshops &amp; Retreats (that all qualify for continuing educational credits for RYT’s.). Founder of the ZFlow Power Yoga Series, Mr. Vincent began his journey in yoga March of 1994. Since that point, his wide range of knowledge, experience, and wisdom in several yoga styles are at an optimal level. To name a few styles… Sivananda, Bikram, Ashtanga, Kundalini, and full dedication under Baptiste Yoga Method, add to the extensive repertoire of Zeek Vincent. In 2014 Zeek became a Certified Yin Yoga Instructor, and honored by Trufusion Yoga LLC to be one of the establishment’s Senior Yoga Teachers that travel and conduct Events &amp; Yoga Teacher Training Programs for Trufusion franchise units. He is an International Teacher that travels extensively around the globe conducting workshops, retreats, and various Teacher Trainings (from 200 hours, to weekend Modules). Also honored by Wild Abundant Life, by Deborah Williamson—Zeek Vincent is one of W.A.L. Master Teachers that conducts 300 Modules.